The BJP in Kerala Thursday embarked on a Rath yatra from here to "protect" the traditions and rituals of the hill shrine of Lord Ayyappa at Sabarimala, which recently witnessed violent protests against the entry of women of menstruating age group. The main Opposition Congress is also launching a series of yatras from Kasaragod, Alapuzha, Thiruvananthapuram, Thodupuzha and Palakkad to protect the faith, fight communalism and explain to the people the "politicisation" of the Sabarimala issue by the CPI(M) and saffron parties. Speaking at the inaugural function of the 'Sabarimala Samrakshana Yatra', former Karnataka Chief Minister B S Yeddyurappa sought the immediate intervention of the CPI(M)-led Left Democratic Front (LDF) government to end tensions at the hill shrine. The Kerala government should "apply its mind" and show seriousness to end the impasse at Sabarimala, he said. "We are not against the SC verdict. But sentiments of the people should be respected by one and all," he said, holding the ruling LDF and Congress-led opposition UDF responsible for the present impasse. During the yatra, Congress will inform the people how the Sabarimala issue was "politicised" by the ruling CPI(M) and BJP, KPCC President Mullapally Ramachandran said. BJP-RSS and various other Hindu outfits have been on the warpath against the Left government's decision to implement the apex court verdict. 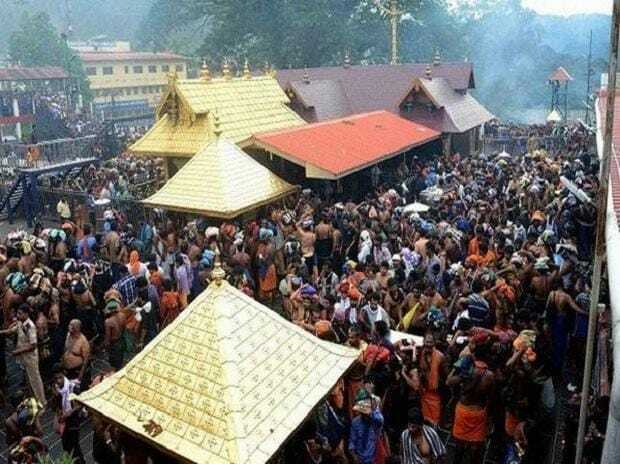 The Ayyappa temple opened Monday for the second time in three weeks for a two-day "Sree Chitira Atta Thirunal" special puja amid unprecedented security over apprehension of protests by those opposing the Supreme Court order, allowing women of menstrual age. Tension had prevailed at the temple Tuesday as nearly 200 frenzied devotees tried to prevent a woman pilgrim, whom they suspected to be of menstrual age, from entering, prompting police to register cases against 200 persons.